Semi-formal ivory dresses and ivory party dresses are great for a variety of events. Whether you're planning your big day and looking for a charming wedding dress or rehearsal dinner dress, or just need a cute and chic casual summer dress for a family celebration, choose one of these off-white or ivory dresses. This section of designer dresses in ivory features short and long dresses from these top designers: Sherri Hill, Jovani, Dave and Johnny, Faviana, and more. Offering an array of styles, cuts, fabrics, and designs, this collection of ivory dresses ensures you'll find the ivory dress of your dreams. 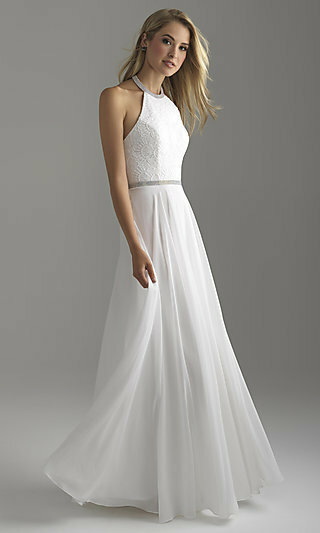 What are the Latest Styles for Bridal Dresses? This extensive assortment of ivory designer dresses offers an abundance of the latest stylish options for the bride-to-be. Simply browse these beautiful ivory dresses for all your upcoming wedding-attire needs. A couture long formal ivory gown with rich embroidery and embellishments is perfect for turning heads as you walk down the aisle. If you want to achieve a romantic, girly look for your rehearsal dinner dress or wedding-reception dress, one of these short lace dresses in ivory is a great choice. For an alluring vibe, try a curve-hugging short open-back ivory cocktail party dress adorned with an intricate design of patterned sequins. Dress to impress in an off-white high-low party dress with quality jewel accents, convenient pockets, and a trendy off-the-shoulder neckline. If you prefer a more modest look for your bridal-shower party dress or reception dress, try a knee-length ivory party dress with a high-scoop neckline and illusion sleeves. Whatever your personal style, let PromGirl help you shine bright on this significant and meaningful day in an ivory party dress from this collection. Ivory dresses aren’t just for brides. Wearing an ivory or off-white dress to senior prom or homecoming is a time-honored tradition. Here you will find long ivory dresses for prom and short semi-formal ivory dresses for homecoming and graduation. If you’re looking to break away from the old conventional standards and showcase your inner fashionista, try one of the more trendy fashion-forward prom or homecoming dresses. Wearing a short prom dress is a growing trend, and this collection provides an array of short ivory dresses for your consideration. Dance the night away with your friends in the comfort of a short chiffon sweetheart homecoming dress featuring intricate floral embroidery and ruffle accents for an ultra-feminine look. To highlight your individuality, try a contemporary floor-length two-piece prom dress with a jewel accented top and mermaid skirt, or slip into one of the unique print dresses for a vibrant, bold look. Whatever style you prefer, choosing one of these ivory party dresses is sure to make your special event memorable. A short ivory party dress is a wardrobe essential, as it can be worn to a variety of events. Ivory dresses are an excellent choice for keeping cool in the warmer months. Show your fashion smarts in a flowing short ivory casual shift dress for graduation. Try a fun ivory print dress for a relaxed vibe at a family celebration or summer outing. Short ivory cocktail dresses accented with sparkling sequins are not only ideal for cocktail hour, but can dazzle at holiday parties as well. Whether it is a short semi-formal ivory dress, casual ivory party dress, or a long formal prom dress in ivory that you seek, shop this section to ensure you look and feel your best at your special event.